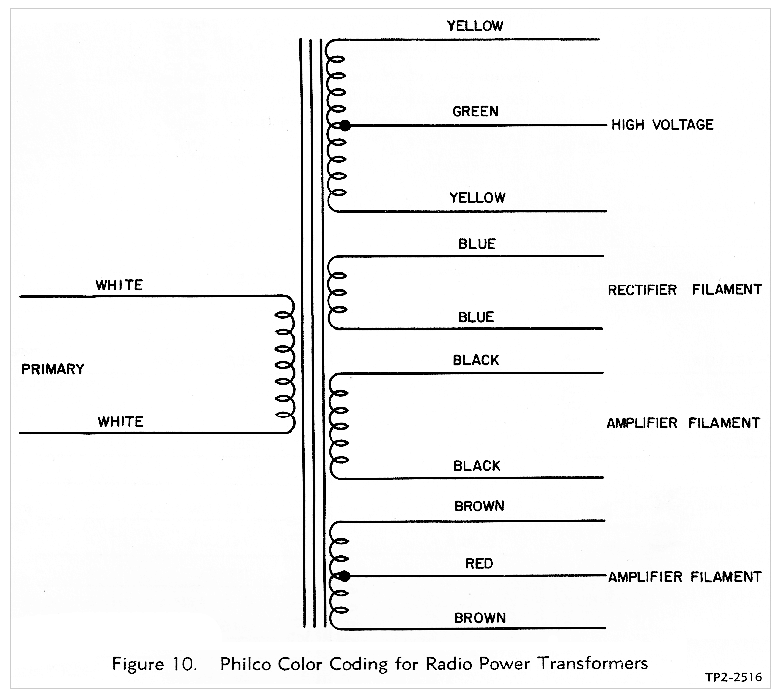 I have a Philco power transformer that is confusing. It is part # 32-8248 It has 2-white 2-Black 2 yellow 2-Red 2 yellow 1-green 1- brown and 2- Blue wires. I have searched to find what the wires represent primary, secondary etc. I ohmed out all the wires and the best I can figure still don’t add up? Can anyone help me with this? The transformer looks very clean. That does not seem like an ordinary power transformer. Post the resistance readings, and a light might come on. When you measure resistance, start with a lead, and then measure to every other lead**. This tells us where there are tapped windings as opposed to individual ones. **Once you find a pair, you don't need to repeat this for all other wires. Example; suppose wh #1 reads 10 ohms to wh #2, and open to all others. You don't need to repeat for wh #2. It has 2-white 2-Black 2 yellow 2-Red 2 yellow 1-green 1- brown and 2- Blue wires. The 2 black/yellow should be the primary. The 2 red/yellow should be the high-voltage secondary. One of the other leads (brown?) should be the center-tap of that winding. The 2 blue wires should be the 5-volt filament winding. The 2 white wires should be a 6.3-volt (or other) filament winding. The 1 green wire should be an inter-winding shield, connected to chassis. You can confirm this by connecting one (1) volt to the black/yellow wires and measure the voltages on the other windings. The voltages should be about 1% of the normal values. Last edited by Leigh on Nov Sat 10, 2018 12:18 am, edited 1 time in total. Why is this in Hints & Kinks?